“P” is for Pension File…and patience! We’re almost through digitizing the P’s in our 1812 Pension Files (can’t wait for Q-Z) and we’re excited about our growing War of 1812 Pension Files collection. Pension files are a rich source for military and genealogical research. In 1813 and 1816, Congress approved a military pension for soldiers who served between 1812 and 1815 and suffered a disability or death. In 1871 and 1878, Congress expanded the pensions to include more veterans. The 1871 act allowed men who had served at least 60 days during the war to draw a pension. Their widows were eligible as long as the marriage had taken place before the end of the war. The 1878 act expanded the pensions further to apply to veterans who had served 14 days in the war or any engagement, and to their widows, regardless of when the marriage occurred. A veteran’s pension often includes his rank, place of residence, age or date of birth, and time of service. A widow’s application usually includes her place of residence, her maiden name, date, and place of marriage, circumstances of her husband’s death, and the names of children under 16. In a few instances, the files even contain a tintype photograph of the veteran. Such is the case with William Perry. 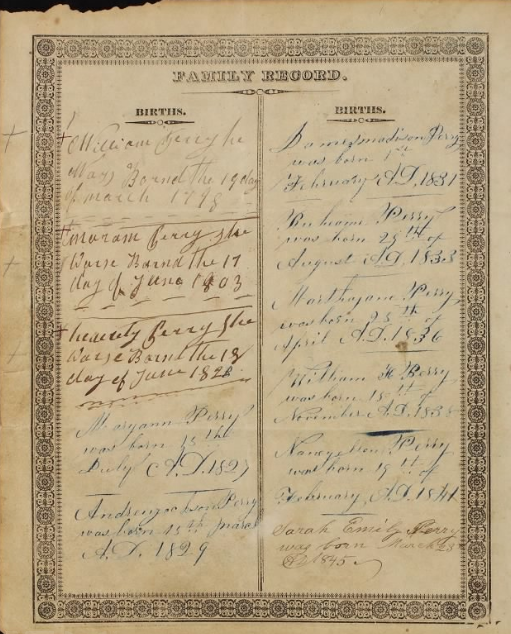 His file is 55 pages long and contains a gold mine of information including pages from his family bible showing births and deaths, and even a summons to appear before the Justice of the Peace for failure to pay a debt of $1.50. In contrast, Malinda Hadley filed for a widow’s pension 25 years after the death of her husband Simeon. Her file is just six pages long and includes her rejected application because no record of Simeon’s purported militia group existed. Our War of 1812 Pension Files collection are organized by state or organization, and then by the soldier’s surname and given name. The process for digitizing the pension files is painstaking and time-consuming. We will keep adding to the collection until it is complete. If you don’t see your ancestor’s pension file, keep checking back! Get started searching our War of 1812 Pension Files on Fold3 today! One of the saddest pension applications (and correspondence) I’ve read was of the widow of my G-G-G grandfather, William Durham Kelly, a veteran of the war of 1812. She applied using his full name; his service record is under Durham Kelly. No one in the government made the connection that they were the same person. She is found in the 1880 census in the county poor house. I’m so sorry to read your post! I found a letter of my Greatgram x4? Still trying to get this right… hiring a lawyer to collect her dead husband’s pension from the Civil War. I really understand how you feel. Politics! IT IS THE WORLDS OLDEST PROFESSION! Interesting fact, and sad she was denied. I believe William Durham Kelly is also my direct ancestor. Would love to compare notes with you. That is so sad So many widows had to put up a tough fight for so little. Bad link in paragraph 1. Can you fix it, please? Sorry about that, the link is fixed. 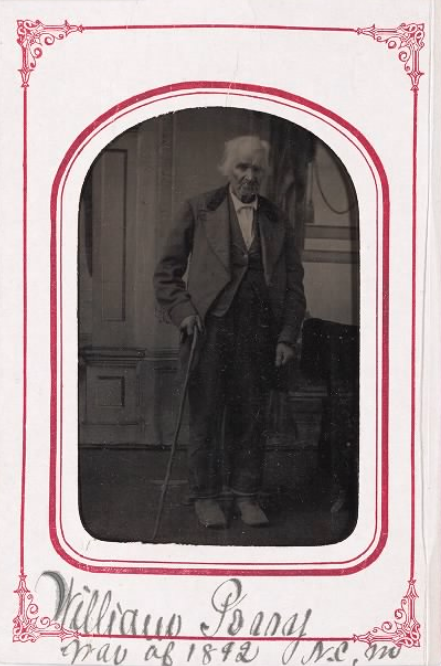 I was using Ancestry.com for years to study the “Olde Robert Selfe” family before I tried Fold3. I was ecstatic when the documents came “flowing” in. The Selfs were in every war fought, so lots of records. Fold3, for me, was well worth the money! Barbara Freemal – I live in Kansas City. My husband is the Self of the family. I know I’ve seen your name before while researching. My husband’s line is Melchisedek Self. There is only one Mel (b1777), so if you look him up you can easily run back to his father, Jacob Elijah Self, or forward to his son, Abraham Pinkney Self, etc. I have the various info on Phillip, Stephen, and Olde Robert Selfe, but I haven’t been able to prove to Phillip. I think he had money problems; I can’t find a Will or anything stating Phillip and Jacob are father and son. Linda, you wouldn’t happen to be Selfs of Virginia, would you? I am a descendent of William Green Self of Alabama and I traced him back to Olde Robert. I would appreciate any info on his wife Sallie. I have her obituary but it doesn’t say much. Thanks. Jerry – Sorry, but Sallie is not a direct line relative so I don’t have anything that isn’t already on Ancestry. You’re right, that was a “darn poor” obituary. I will ask some of the other Self researchers if they have anything to offer you. Just know, in two days I won’t be able to use the blog. 74% complete. Any forward progress is good and very much appreciated, but realistically we researchers have been more than patient. When I saw a couple years ago that the progress was going slowly, I decided to keep tabs on the progress, hoping beyond hope that “soon” the files of “R” “S” and “V” would be completed. This has been the movement: as of March 6, 2017 65% was complete; and as of December 14, 2017 65% was complete. Obviously 2017 was a lousy year, considering there was basically no movement, with only about 1000 documents in total digitized. These files, it seems obvious, were not considered a high priority, not enough funding, I’m guessing. 2018 was a better year. From March 21 through June 27, the completion went from 67% to 70%, an average of 1% a month. Since June 27 through today, almost 7 months, the progress has been 4%. Based upon these statistics, and assuming the best movement (1% per month), it will take at least 26 months to complete. If the progress is more in line with the last 7 months, then we are looking at more than 4 more years of waiting. I don’t even want to consider the wait if there’s another year like 2017. Sadly, a lot of genealogists will die before these records are complete. I’m not blaming the people in the ranks, who I am sure are doing their darndest to get these records available to the public. Whoever the people are who control the purse are the problem. I am probably one of the lucky few who are able to visit the National Archives once a year to look at the available records there. And I can’t say enough nice things about the dedicated staff. They are almost all passionate about their work and very willing to give their time and expertise to researchers like me. However, many of the War of 1812 pension records are in a no-man’s-land, no longer at the Archives but not yet available on-line– just sitting somewhere waiting to be digitized. I would respectfully ask that copies of these files in no-man’s land be made and given to a researcher who visits the National Archives and requests them (or requests them through the mail). Let me explain: Last year a wonderful staff member told me that the “Swepston” War of 1812 pension files that I wanted, were in that no-man’s land. So what did she do? She contacted the person who had access to these no-man’s-land files, that person zeroxed the files and faxed them back to the National Archives, and the wonderful staffer gave me the copied files– at no charge. Yet the year before when I visited, I was told by another staffer that these very same “Swepston” pension files were not available because they had been moved, awaiting to be digitized. I would have to wait until they were digitized and put on Fold3. Considering the pace of digitization, it is unreasonable to be told what I was told in 2017. Instead, the default position should be what the staffer did for me last summer. I agree 100%. And the lack of communication with the very people who helped fund the project, and have been more than patient, is disrespectful. Fold 3s presented files leave much to be desired. What happened to the Civil War Widow’s pensions that was never completed? And where are the records that were to be done regarding WW1. Difficult to rely on the site. Barbara, David and Jerry – Please contact me through lindaluself@gmail.com and we will discuss the Selfs. Olde Robert Self came from England to Westmoreland County, Virginia, so, yes, I have Selfs in Virginia. Barbara, if you are looking for a pretty accurate Public Tree on Ancestry, look up Melchezedec/Melchisedek Self. Look for the Public Tree names “Gary Rice” or “David Newlin.” Melchisedek Self was born in 1777 and there is only one Mel. Once on Mel, you can go back in time to Olde Robert Selfe or forward in time. There is a Facebook group that works on all the Selfs in the U.S. you might be interested in, and there are some other Self genealogy groups you might want to know about. Once you contact me, I can tell you about those groups too. Very nice to meet you! Barbara – Per my instructions above, look up Melchizedek on the Public Trees and look for the names Gary Rice or David Newlin, both men have very accurate (not perfect) Public Trees. Thanks, I will do that. I have found a lady in England, from the Young at Heart group, who sent me photos of the Selfe coat of arms on the ceiling of an abbey in Wiltshire. The same abbey where Harry Potter was filmed! Selfes were also in the church cemetery, but stones were unreadable. I’ll send that to you. Interesting info. I do have one War of 1812 pension for widow record that popped up online at Ancestry a couple of years ago. Don’t know how it was discovered & publicized. And I do have one Revolutionary War veteran’s published memoir. That was an unbelievable find! It will be great for many researchers if all the records described can be added to Fold 3/and/or made public!